This is a review of Nature’s Bounty Biotin. The manufacturers claim this product aids the body in the production of energy. They further claim this product is necessary for healthy hair, nails, and skin. To learn more about Nature’s Bounty Biotin’s ingredients, side effects, guarantees, and if it is the right product for you continue to read here. Biotin is the only active ingredient in this product. Biotin metabolizes fats, proteins, and carbohydrates into energy which is important to hair, skin, and nails. The remaining ingredients make up the capsule the biotin is enclosed in. The manufacturer recommends taking one tablet up to five separate times each day. They also recommend taking them with food to avoid upset stomach. It is also recommended not to be taken by women who are pregnant or breastfeeding, or people who are on medication, without talking to their physician first. The website showed the only possible side effect of taking Biotin is an upset stomach if taken without food. 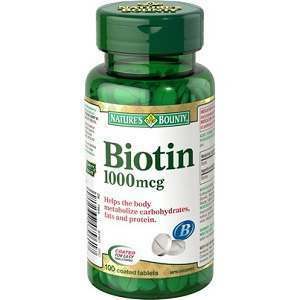 If you are allergic to biotin do not take this product. Symptoms of an allergic reaction are rash, dizziness, or vomiting, if you take this product and experience any of these reactions discontinue use immediately and see your physician. The manufacturer sells Biotin for $13.44 for 100 tablets. This product is available for purchase in many stores or online from various websites. If ordered online, shipping and handling charges will be added. If you visit the website for Nature’s Bounty Biotin, you can sign up to receive their newsletter via e-mail, and they will give you a coupon for $1.00 off the purchase price. The manufacturer offers no guarantee for Biotin. If purchased through a store or online some may offer a refund on the product. The return policies vary between each retailer. Nature’s Bounty Biotin is an ingredient which has been proven to contribute to the re-growth of hair. It should be noted this product is vegetarian-friendly as it uses no animal products in the making of the tablet. Nature’s Bounty Biotin boosts not only hair, but also skin and nail health. After research, consumer reviews showed more than sixty percent were happy with the results of taking Biotin. Most of the positive reviews claimed results were seen after a period of three months. Negative feedback consisted of complaints of slow results to no results. There is no guarantee for this product. Research could not find where this product is manufactured. The dosage is high compared to similar products consumers use to help with hair re-growth. Five, separate times each day is what is recommended plus it is recommended to eat with each dose, which is also on the excessive side. John Brownstone	reviewed Nature's Bounty Biotin	on August 3rd	 and gave it a rating of 3.